Over the past decade in particular, with an increase in the number of TV programmes about buying property abroad and with ever cheaper flights from budget airlines making travel even less expensive, there has been a surge in the number of people who are nearing retirement considering buying or renting property abroad. The lure of warmer, sunnier weather alongside an often less expensive cost of living than here in the UK, combined with a less hectic, more laid-back approach to life has increased the appeal of this even more. But, is it as simple as that? Whilst many of us are only too keen to go on two or three holiday jaunts a year to escape the UK, actually retiring abroad is going to be very different. Many retirees are tempted into selling up and buying a home overseas when they compare the prices for houses/apartments abroad against what they’ve got here. For example, they may live in a 2 up 2 down terrace here in the UK yet have discovered that they could get a 2 bed modern villa with pool for the same or even less amount of money than they’d be able to get if they sold their house in the UK. It’s important to understand, however, that the actual cost of a property overseas is just the beginning of your spending. You’re likely to have legal expenses, local taxes, the cost of new furnishings and appliances and perhaps many other hidden costs to deal with so you need to do your homework first and to seek sound advice from a legal representative in the country where you’re planning to move to. There will be removal costs to consider, insurance issues, maybe a new car purchase and other things that will add to the cost overall. Many retirees who harbour thoughts of spending their latter years in retirement overseas often choose to make the wise move of renting before they buy. They might initially spend the winter overseas in a long-let rental property for 3 or 4 months, and then return to the UK in the summer. In fact, many retirees prefer this arrangement as it helps them keep their home in the UK which they can always rent out whilst being able to spend a considerable time in an overseas property without over-committing themselves straightaway. 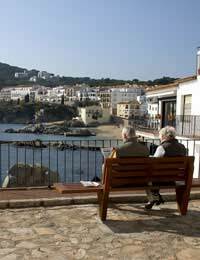 It’s important to do your sums first if you are considering buying a retirement property abroad. It’s not enough simply to look at the ‘here and now’ but to try and predict how your income might fluctuate once you get older and whether or not you’ve set aside enough funds to cover any emergencies. You’ll need to also look at how living abroad might affect you in terms of if your spouse becomes disabled or if you’re suddenly bereaved and whether or not you’ve got a workable ‘escape’ plan in place, should you need to return to the UK to live. It’s very easy to get ‘starry-eyed’ about the thought of retiring abroad. And, whilst many expats will tell you that it was the best move they ever made, it’s not something which you should enter into without finding out more facts and discussing things with both professional advisors in the housing market as well as considering your own future and weighing up the pros and cons. Maybe renting a long-let might be more suitable initially but whatever you do, above all else, you should have a contingency ‘escape’ plan in place should you need to return to live in the UK for whatever reason as although retiring abroad can be the stuff of ‘dreams’, it has, for some, turned out to be a nightmare if things haven’t been thought through properly first.